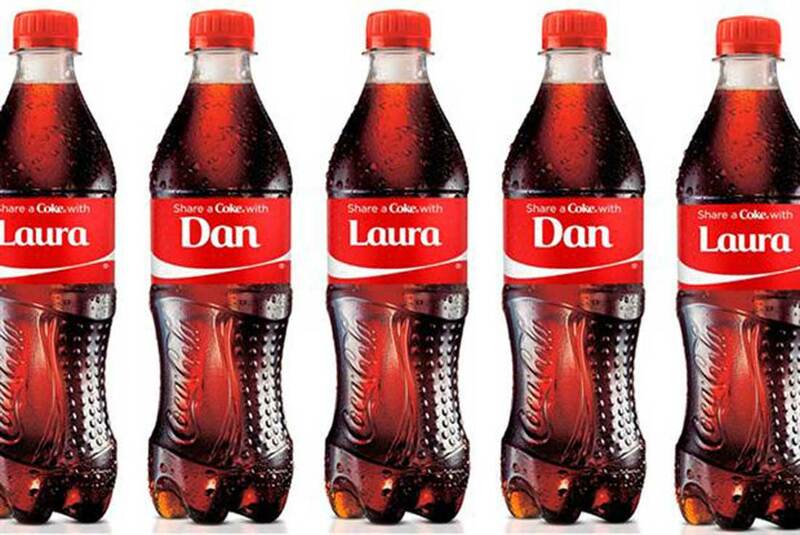 2013 was filled with innovative and brilliant social media moments from some awesome brands. Let’s take a look at my personal favorites and see what brands can learn from them as we start off the new year. 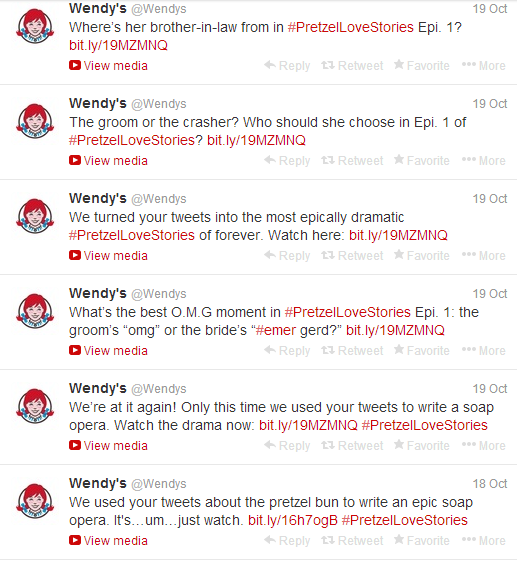 Wendy’s made thousands of consumers laugh in October of 2013 when they created a ridiculous, soap-opera style video featuring over-the-top actors reading real tweets from consumers. Why It rocked: The video is hilarious, and incorporates user-generated content in a fun, interesting and engaging way. The hashtag #PretzelLoveStories is short, sweet and to the point. 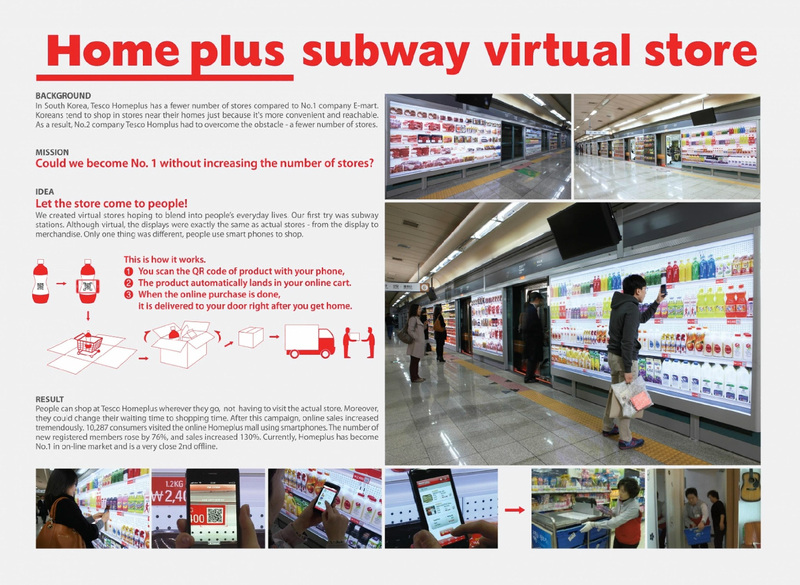 Plus, the idea is original and Wendy’s let consumers feel like they are really contributing to the campaign! 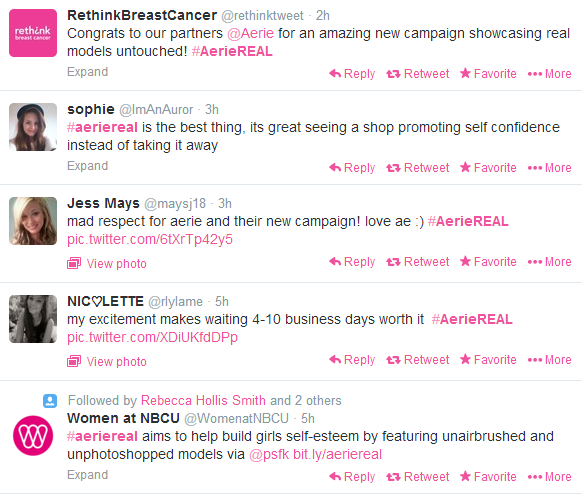 Lesson learned: Utilizing user-generated content is a great way for brands to interact with their consumers. However, brands should make sure that they don’t require the user to put too much work into the content. Asking them to write a tweet with a hashtag may seem a little simple, but brands should focusing on finding unique and creative ways to use that content. The hills are alive, with the smell of pizzaaaaa! 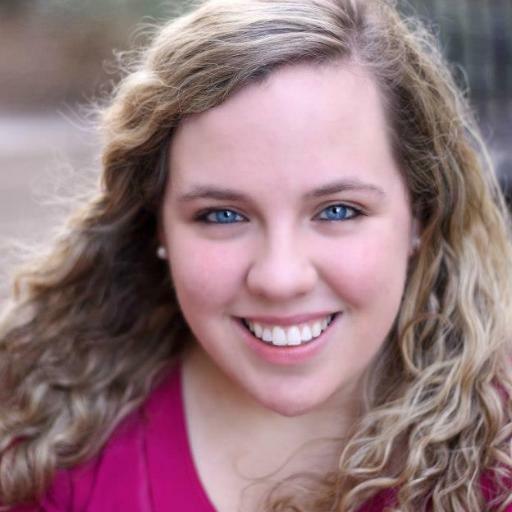 DiGiorno scored big when they live-tweeted during NBC’s “The Sound of Music Live!” The company used their witty sense of humor to play on the sentimental and beloved musical, and managed to sneak their way into their consumer’s heart. Why it rocked: The brand took consumers by surprise, talking to fans when they weren’t expecting it. Who would have thought that “The Sound of Music” and pizza have anything in common? (hint: they don’t!) While most brands focus so much on major events, they sometimes forget that reacting to smaller moments of pop culture can also generate some great buzz. 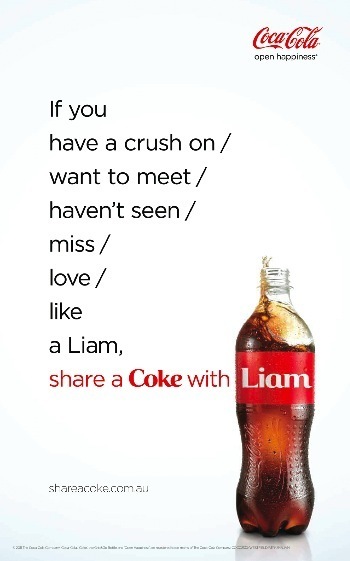 Lesson learned: Brands should come up with unique ways to connect their brand to pop culture events and current happenings. And not just major events, like the Super Bowl or Royal Wedding. 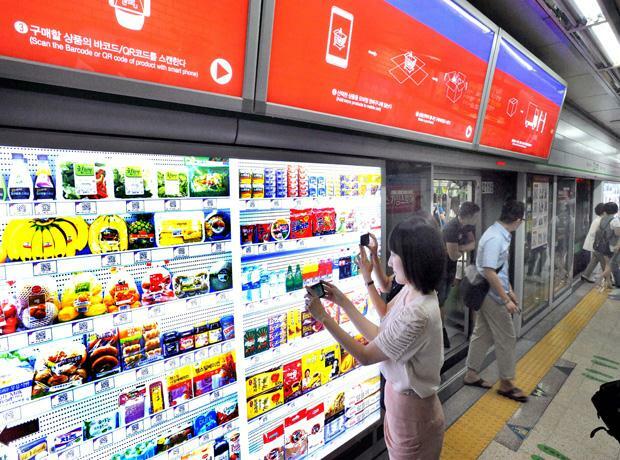 Companies should strive to catch their consumers at unexpected times and places. 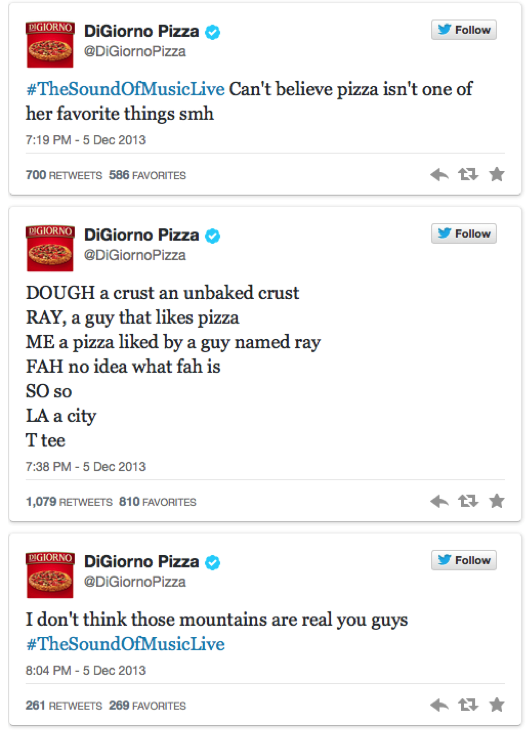 DiGiorno only tweeted 3 times during the event, which was enough to keep users engaged, without clogging up their Twitter feed. Sometimes, less is more. It all started with a tweet from a random user, who inadvertently got two big-shot chocolate candy brands to go head-to-head in the real-time marketing event of the year! 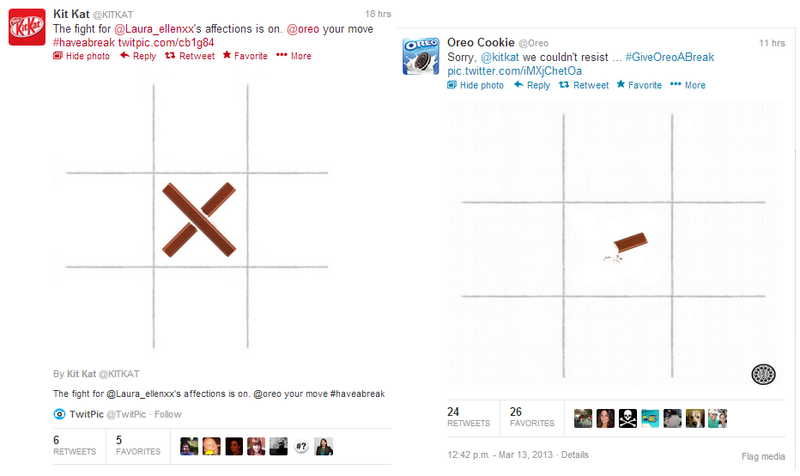 Both Kit Kat and Oreo vied for the affection of a consumer through a little game of Tic-Tac-Toe. The results were hilarious and entertaining! Why it rocked: Both Kit Kat and Oreo showed that they really listen to consumers, and they took advantage of a major opportunity to engage with another brand on Twitter. The tweets were unexpected from such giant brands, and show that both the Kit Kat and Oreo brand are approachable and silly. Both tweets were genuinely funny too. Lesson learned: Responding to consumers is key. Social media is not one-sided. In fact, it’s quite the opposite. Brands need to interact with both consumers and other brands to ensure that they are reaching customers. Also, brands should focus on giving their company a voice and personality on social media. That was the messaging strategy behind a brilliant campaign by Water is Life that spread like wildfire across Twitter. 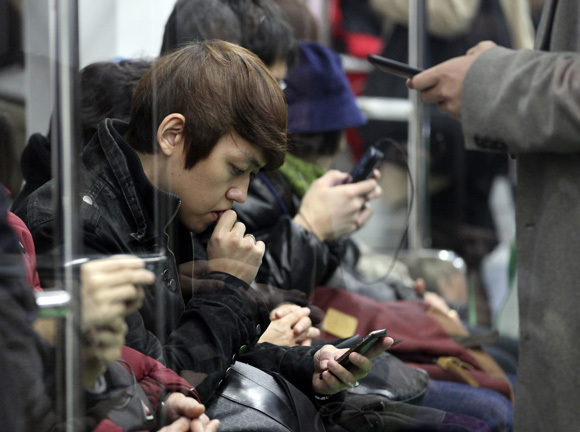 One of the best viral campaigns of 2013, the video displayed individuals in third-world countries, like Haiti, reading #FirstWorldProblems tweets written by everyday Twitter users. Why it rocked: The juxtaposition of these individuals living in third-world countries and the tweets of people complaining about such trivial things makes the campaign memorable and meaningful. The video gained traction and got tons of people talking about the company. Lesson learned: The best way to make people care about your brand is to understand your customers and talk to them using something that they know. 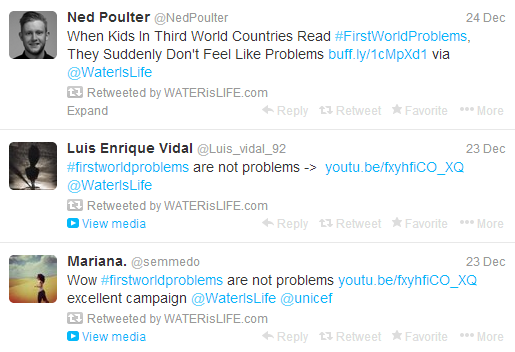 Water is Life took advantage of a trend, #FirstWorldProblems, and got thousands of people’s attention. Again, the success of this shows that keeping up-to-date on current trends and finding ways to incorporate the message into this trend is help bring the campaign to life. 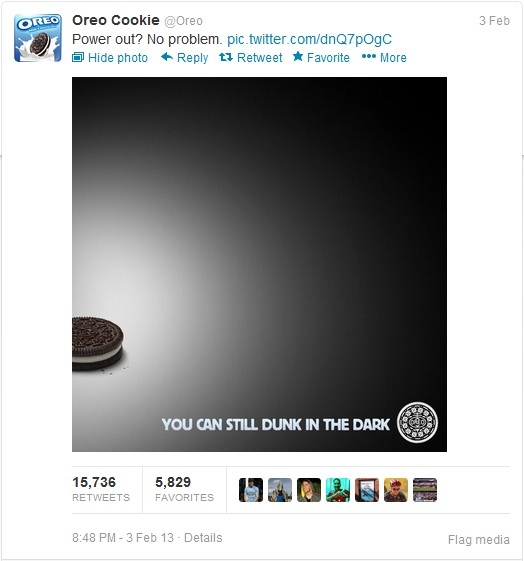 Ask anyone on Twitter, and they’ll tell you that Oreo’s “You Can Still Dunk in the Dark” tweet during the 2013 Super Bowl knocked it out of the park. Oreo took advantage of the lights going out during the game, and jumped into action to post a timely, applicable tweet. Oreo had experience cranking out great content quickly, after their 100-Day Daily Twist campaign. 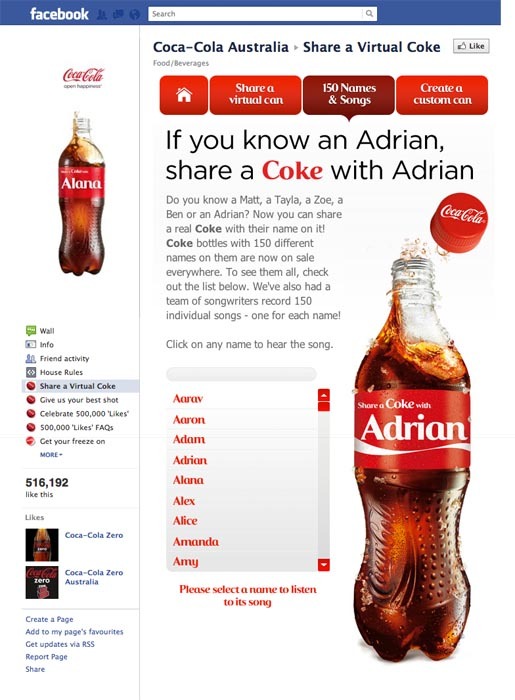 Why it rocked: This is an example of real-time marketing at its finest. The Super Bowl is a huge time for brands and social media activity, and Oreo stepped up their game and made a memorable impression. The tweet was re-tweeted about 16,000 times! Lesson learned: Timing is everything. Being able to think quickly and cleverly is key in social media. While content calendars and planning tweet ahead of time ensure that the brand is consistently active on Twitter, companies shouldn’t be afraid to post things on a whim. Are they any moments you think I missed? What was your favorite?